Yangon (Agenzia Fides) - In different parts of the Kachin State of Myanmar, a Burmese state with a Christian majority population, the conflict between the Burmese Army and the Kachin Independence Army (KIA) has intensified: says a note by the "Jesuit Refugee Service", engaged in the assistance for refugees, sent to the Agenzia Fides. Local Churches and non-governmental organizations launch a strong appeal for the end of hostilities and the resumption of dialogue. JRS partners in the region continue to accompany internally displaced people in safe places, organize various activities for children, and visit newly arrived families in the camps. JRS also works to assess the most immediate needs in the areas with the highest number of displaced persons, taking into particular account educational needs. Prior to the resumption of hostilities, JRS supported partner organizations working in the Kachin state by providing educational services in displaced camps, taking charge of school tuition, providing educational materials, providing teachers' salaries and training. In the wake of heavy artillery bombardments and aerial incursions by the Burmese armed forces, thousands of civilians - especially women and children - have left their villages. From the United Nations Office for the Coordination of Humanitarian Affairs (UNOCHA), we learn that more than 6,800 people were displaced in April alone. 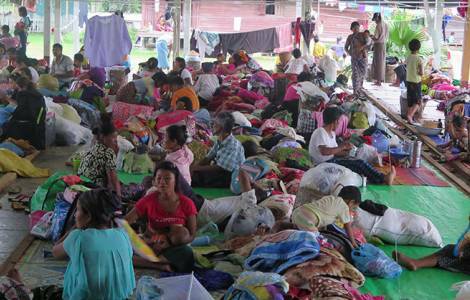 In total, more than 100,000 internally displaced people are currently living in camps set up throughout the Kachin state.